CEO. Glamorous movie starlet. Studio owner. 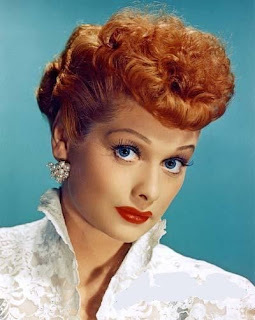 She was all of those, but Lucille Ball will always be remembered for her zany, physical comedy on the "I Love Lucy" show. Many of her most famous scenes were mostly physical pantomime, slapstick and sight gags. Much of her dialogue was the opposite of what you'd expect from a powerful woman: shrieks, wails, and laughs. Discussing how she became an executive, Miss Ball said: ''My ability comes from fairness and a knowledge of people. I ran my studio like I run my home, with understanding of people. We touch in our house. I tell my children, 'There's so little time.' '' ....on the set, she was said to know every term, every lighting fixture and every worker. Her trademark shtick was mentioned, but put aside for the night: Right at the start, Ball refers to crying at some of the tributes, then points to her fake eyelashes and jokes about not wanting them to run down her face. But she does it in a way that makes clear her remarks will not be funny in that way: "I did that in a show once and it worked, but not tonight." That line lets her transition to a more serious tone. She devotes ample time thanking others: As a hardworking executive, she knew the effort that went into mounting such a show, and devoted much of her speaking to thanking others. "The entertainment tonight was special. Really special, perfect," said the perfectionist herself. "I heard different things tonight from different people, and for all of you who shared your talents so generously, I applaud you again." Then she leads the group in applause. She also devotes significant time thanking the behind-the-scenes person from Variety Clubs International, producer Mike Frankovich. Since this was a televised special, using on-air time to thank others was a generous gesture. The humor was gentle, and used sparingly: "For all of you who said such really wonderful things about me, I just wish you were all under oath" is a line anyone might use at such a speech. It doesn't distract from the proceedings, and lets the audience have a brief emotional outlet in laughing that helps balance the rest of the remarks.